Please fill out form below for inquiries regarding custom jewelry. I CREATE CUSTOM JEWELRY OUT OF BOTANICALS AND OTHER OBJECTS YOU HOLD NEAR AND DEAR TO YOU THAT YOU WOULD LIKE TO WEAR. I have created custom jewelry out of wedding flowers, memorial flowers, sand + crinoids, hair, ferns, etc. Please fill out the form below so I have a better idea of your request and we can work together to make some special jewelry! 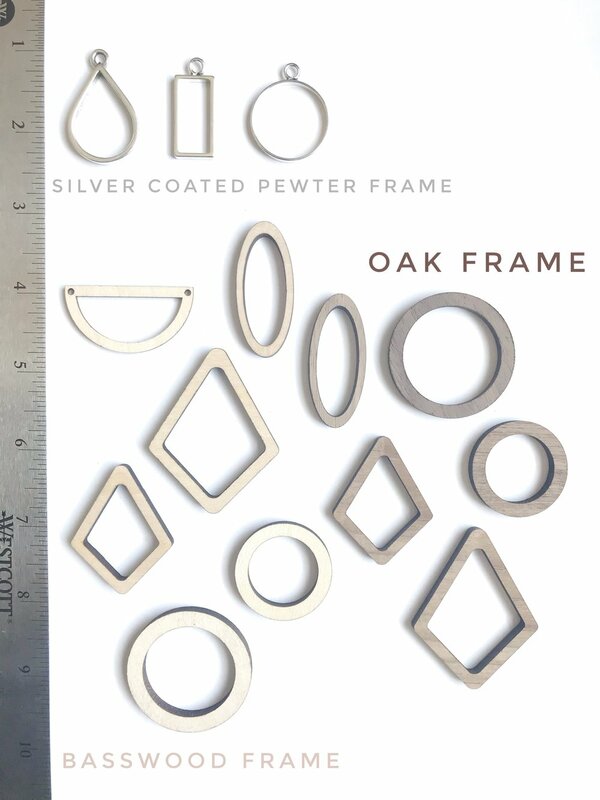 I make earrings and necklaces out of basswood, oak, and silver coated pewter frames. These come in a variety of sizes and shapes. Additional forms will be sent out in response to the submission of your form (see example below). Which (or all) styles of jewelry are you interested in? If material needs to be preserved (any material placed in resin must be 100% dry), are you able to do this? Thank you for your custom order inquiry! I will be in touch soon!